® BRUSH CUTTER CompaCt traCk/Skid Steer LoaderS & traCtorS Built Strong and Tough for All Conditions and Terrains. Built to handle all the Xtremes. Xtra Large Cutting Swath for Cutting, Clearing and Mowing. One Xceptional Attachment! 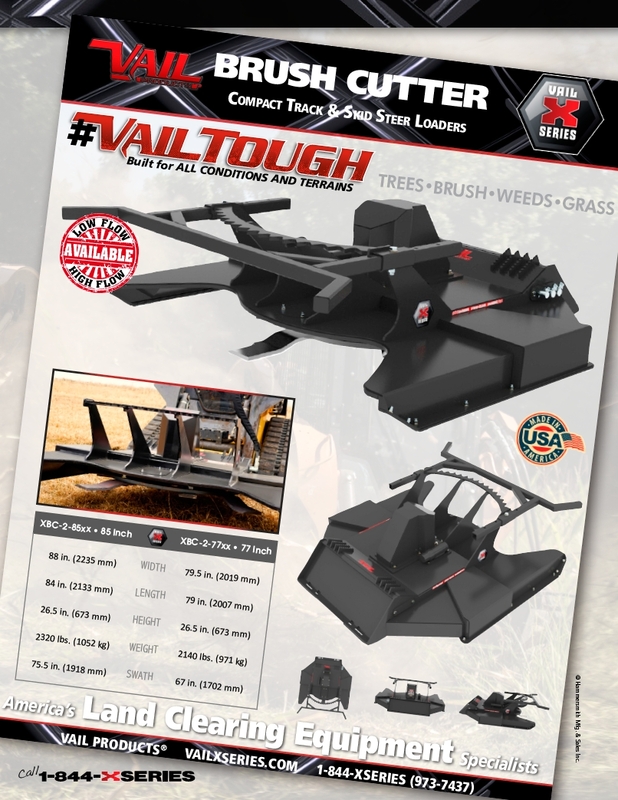 FEATURES TREES•BRUSH•WEEDS•GRASS • AdvAnced HydrAulics for Xtreme cutting Power & longer motor life • All-terrAin flywHeel design • Quick-stoP multi-BlAde system • 85” • 77” • 66” wide models • cAn Be used on stAndArd & HigH flow • trees, BrusH, tAll grAss Are no mAtcH America’s Land Clearing Equipment Specialists VAIL PRODUCTS® VAILXSERIES.COM 1-844-XSERIES (973-7437) Call © Hammersmith Mfg. & Sales Inc.